Eponymous owner reveals he's taking precautions to prevent terror in - or from - his stores. Rami Levy, owner of the eponymous grocery store and cell-phone mega-chains in Israel, has decided to remove knives from his shelves in light of the rise in stabbing attacks on Israeli citizens. Several of the attacks were perpetrated by Arab employees of Israeli companies, some working legally, others not. "Everyone who enters my store will go through an inspection," he said. "Another measure that we're taking, for example the knife displays in our stores - we took them down." He explained that the inspections are to prevent workers or customers from entering the store armed with knives, while removing them off the shelves is to prevent a potential terrorist from acquiring a knife within the store itself. Now, he said, customers who wish to buy knives need to go to the Customer Service desk. The butcher counter is a separate, and more difficult, issue. "There is more criticism regarding the butcher's counter, but we don't accept any workers without a detailed background check first," he explained, adding that he purposely has "Jews and Arabs working together" in that section to prevent extremism from winning on either side. 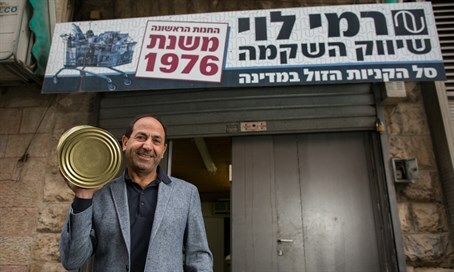 This is the first time Rami Levy has removed knives from his shelves - even after a Rami Levy branch itself became the scene of a major stabbing attack on shoppers in December.